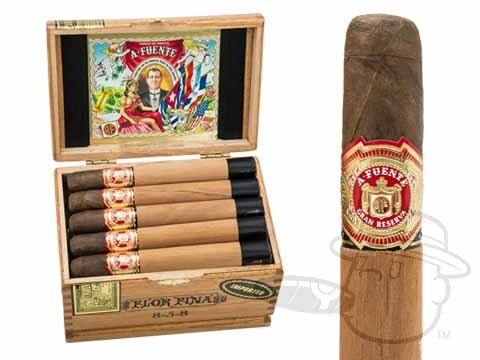 A-Fuente Gran Reserva is more that just the finest smoking enjoyment a cigar lover can experience, it represents Four Generations of family tradition, that include love, pride, and personal sacrifice. The Arturo Fuente 858 Sungrown features an exclusive Ecuadorian Sun Grown wrapper, which adds a bit more body and smooth flavors of earth and spice to the classic profile of the Gran Reserva line. I like them a few times a year. Has a more full body taste and always with these cigars very well constructed , perfect draw. For me not a every day smoke , but for treat its perfect. LOVE the sun grown , just not at 8. These are a great smoke! These are a fabulous "slow burning" smoke with large quantities of smoke and an even burn. At this price and free shipping, they are a STEAL. I have never smoked a bad Fuente cigar. Truly one of the worlds great cigar manufacturers! Arturo Fuente 858 Sungrown is rated 4.4 out of 5 based on 4 customer ratings.